һ����Ч�Ĺ�˾��վ����Ҫ�� ��������һ����Ч�Ĺ�˾��վ�� ��˾��վ�ܹ����ҵĹ�˾�������⣿ Is it Search Engine Optimisation (SEO) can boost my sales? Is an effective company official website important to us? How to obtain an effective company official website? �������ǵ�һ��ҵƽ̨ Malaysia No.1 Business Portal: www.newpages.com.my ��վ���� Company Website Design with SEO. ��վȡ������Ա��2������չ����ҵ�� - Culmi Air Cond & Refrigeration Parts Supply Sdn. Bhd. ����ɣ���豸�쵼Ʒ�ƣ�ѡ��Ե���վ��Ӧ�̣��°빦�� - Sauna Holm Sdn. Bhd. ��վ���ֵ꣬�½�װ����ҵ��鲼���� - Stunning Curtain ��վ�ù�˾ҵ��ٷ�֮�ٵ����� -Siang Fatt Sdn.Bhd. ��ƷOEM�����ⶩ�����ϣ������г����������� - All Security Technology Sdn.Bhd. ͸����վ��һ���õ����600-700���µĹ˿ͣ� - First Multi Ever Corporation Sdn.Bhd. ���澭Ӫ��վ��Google�����ؼ��ʣ�����ԴԴ������ -Grand Meltique Food Trading Sdn.Bhd. What our clients say about NEWPAGES! Mahkota Executive Spa - http://www.jmauto.com.sg Very appreciating supports from Newpages throughout our co-operation these years. Their dedicated services are excellent. Creso Industries and Supplies - http://www.cresois.com The system does matter that we are able to come across a few customers that they might not be attracted by the marketing flyers. SIL Technology Sdn Bhd - http://www.siliconinst.com We're very appreciating supports from Newpages throughout our co-operation these years. Your company dedicated services are excellent. Alexis Uniform Sdn Bhd - http://www.alexisuniform.com It helps to improve our site visibility within the search engines. The site provides a professional image for our company. It looks great and easy for us to update our products whenever we want. Asia Sound Equipment (M) Sdn Bhd - http://www.asiasound.com.my We started using NEWPAGES��s services for a couple of months, we can see the different if compare with the past. AS Cleaning Equipment - http://www.ascleaningequipment.com Thanks to Newpages. We really appreciate the excellent support from their staff which helped our business to grow a lot. ASIAN ART-STONE (M) SDN. BHD. - http://www.asianartstone.com We strongly recommend NEWPAGES because their business platforms helped you to reach most of the potential buyers. V K Golf - http://www.vkgolfshop.com They have been able to service a broad range of our business needs while always remaining flexible, cost effective, and most importantly lightning fast. 5 Star Mattress & Furniture - http://www.5starfurniture.com.my We're very appreciating supports from Newpages throughout our co-operation these years. Our business have grow up to 30% . CP Crete Sdn Bhd - http://www.cpcreteflooring.com We're really happy with appreciating supports from Newpages throughout our co-operation this year 2015. Their services are really excellent. Uncle Fishy Entertainment - http://www.unclefishy.com Newpages has provided very excellent technical and customer service support! Strongly recommend Newpages services! Sun Master Fancy Paper Sdn Bhd - http://www.sunmaster.com.my We're very appreciating supports from Newpages throughout our co-operation these years. Their service is patience and respond very quickly. Summit World Resources - http://www.summitworld.com.my We got a lot of qualities lead, enquiry thru new pages well organized platform. Greenhill Industries Sdn Bhd - http://www.greenhillind.com Newpages gave advices that was very professional and knowledgable. Since then, our company site has gained a huge increase of views through the search engines and general news sites. Dzign Creation Sdn Bhd - http://www.dzigncreation.com.my Newpages services are excellent, with the weekly report provided can let us analyze the result very clear. Dzign Creation Sdn Bhd - http://www.cobrasports.com.my We have strengthen our online exposure in the sports industry. We look forward to continue working with newpages in the coming years ahead. KM Uniform - http://www.kmuniform.my We're very appreciating supports from Newpages throughout our co-operation these years. Their dedicated services are excellent! Btec Industrial Instrument Sdn Bhd - http://www.btec.asia I love your services which know what i want & meet my expectations. Culmi Air-Cond & Refrigeration Parts Supply Sdn Bhd - http://www.culmi.com.my Wonderful works done by NEWPAGES with strong supporting team in creating resultant force with ultimate extreme business exposure of my company. Southern State Sdn. Bhd. - http://www.southernstate.com.my After we change to NEWPAGES at May 2012, we start receiving inquiries and those inquires become deal. That is called Quality Inquiries. Double K Air Conditioning & Engineering Sdn Bhd - http://www.doublek.com.my Thanks NEWPAGES for give us a good customer services & fast reply when we need any changes. Syarikat Cathay Letrik - http://www.syarikatcathay.com Newpages had increased our reputation and popularity. Customer get to know us through Internet and we meet more potential customers! Fresco Cocoa Supply PLT - http://www.peluangniaga.com.my We're very appreciating supports from Newpages throughout our co-operation these years. Will look for long term coorperation . VG Sofa (M) Sdn Bhd - http://www.vgsofa.com Your service is important to our company, Newpages had performed with our expectation! Keep it up and Thanks! First Multi Ever Corporation Sdn Bhd - http://www.myfmecorp.com We tried many traditional way to increase our sales, but I think Newpages is the most effective, one of our strategic on internet marketing to increase our sales. TEGS Asia Sdn Bhd - http://www.te-gb.com We sincerely appreciate your responsiveness and the way you conduct business. We have recommended your company to others. 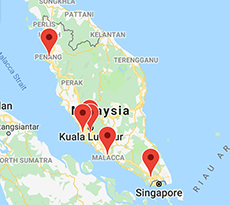 Nenas Furniture Systems Sdn Bhd - http://www.nenasfs.com.my In this era where almost every sourcing is done through the internet first , a good service provider is more important than ever. I'm an older generation kind of guy. Over 50 years old! Can't type a quotation yet after all these years BUT I do find NEWPAGES salesperson to be professional, patient and helpful and their after sales service EXCELLENT! I think I was a very difficult customer to please and convince. Orang tuamah! NENAS has been getting more quality enquiries through NEWPAGES and my salespeople are so please that we have extended our contract with NEWPAGES to two ( 2 ) more years. NEWPAGES ! Thank you very much. Kohaku Koi House Sdn Bhd - http://www.kohaku-koi-house.com We have been impressed by your team of staff who are responsive, reliable and responsible. Thank you for your company's tremendous support over the years! Acefield Automotive Equipment Tools Sdn Bhd - http://www.isaki.com.my Our sales from internet are 30% of our total sales in year 2012. We trust NEWPAGES can help us to get more Malaysia market share in future!